I've now completed my first ever IVF cycle through The Study. It was a bona fide wild ride physically and emotionally, and despite thinking I'd be all laid back and nonchalant throughout the process, I totally got sucked in. And if you are checking in to find out the answer to one very specific question? The first surprise BOMB dropped the night I was to do my Ovidrel trigger. I had done a blood draw that morning to monitor my estrogen & progesterone levels, followed by a sonogram to measure my follicles. The doctor confirmed that I had enough large follicles to trigger with Ovidrel that evening, and that a nurse would be calling with instructions. Shock. I had NO idea that could even happen. That the transfer part of this cycle could be cancelled just.like.that because of elevated progesterone levels. My stomach dropped to my feet, tears welling in my eyes, and I could physically feel my heart thumping in my ears. And so it was that this became a "freeze-all" cycle (a new term to me), where the only option was to freeze all surviving embryos toward a future Frozen Embryo Transfer (FET). The FET itself necessitates another month of medically 'readying' my body for implantation, not to mention an additional 3-4k out of pocket. So yeah, a pretty HUGE and disappointing turn of events. The retrieval was OF COURSE scheduled for the morning we were leaving for Wimberley (of course!). I had to do all of our major packing the day before, and thankfully was able to get our nanny to help out with Iyla the morning of the procedure. I was put under general anesthesia, and when I awoke, a nurse told me they'd retrieved 17 eggs. 17 eggs! I was pleasantly surprised by that number, and curious to find out how many of those were mature. Because this cycle was now a "freeze-all," I would be getting fertilization reports on the developing embryos via phone calls every 2 days. My clinic starts freezing embryos on the 5th day after retrieval up through day 7. Whatever hasn't continued to develop and grow by day 7 is discarded. Thus began the nerve-wracking journey of waiting for my fertilization updates. *Day 1 report: of the 17 eggs, 14 were mature, and 9 fertilized. Still feeling OK about that! Hoping the bulk of those little guys keep dividing, but also bracing myself that often the original fertilized number drops as the days go by. 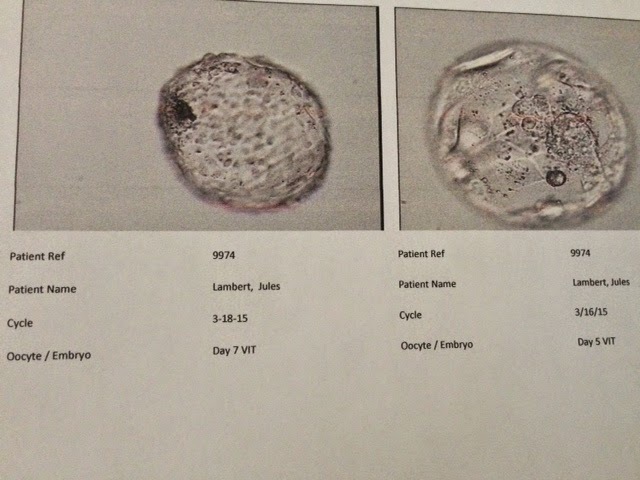 The embryologist said that the 6 and 8 cell embryos had the best possibility of continuing to divide and grow, and that we'd know a lot more with Day 5's updates. Here's where the 2nd bomb drops. *Day 5 report: ONE embryo got to the blastocyst stage needed and was rated a "CC", which is the lowest grade they'll even allow to freeze. The embryologist said one other embryo was close behind but hadn't yet developed the necessary inner cell mass. It was likely the others wouldn't make it to freeze. I was- quite simply- devastated. Even though I'd braced myself for the fact that sometimes women have NO embryos make it to freeze, I had still hoped to have 5 or 6 of the original 9 make it. Yet here I was being told that so far just ONE embryo made it to freeze and maaaaaybe one more might get there. I couldn't help but feel this must mean I have crappy eggs- to produce so many yet have so few survive. I wondered if paying for an FET would even be worth it with just one not-so-great embryo, given my doctor's usual protocol is to transfer 3-4 embryos at a time in women my age. I also found out I couldn't qualify to do The Study again since I hadn't made it to retrieval. That was coupled with the fact that our lifetime infertility insurance coverage was just about maxed out, meaning any further interventions would all be paid out of pocket. I cried over the fact that I may never be pregnant again. That there was a good chance Iyla would be an only child. I was so, so sad. And then? Another turn of events. The embryologist told me that this 2nd embryo had 'completely hatched,' which is apparently a really, really promising sign. It was rated a "BC," so a little higher grade than the day 5 embryo (that she said could very well have improved in grade had it continued to develop). Talking to the embryologist completely lifted my spirits. I had been feeling like I had a low quality day 5 embryo, but she reassured me that both embryos looked very good, and both had an excellent chance at surviving a thaw and continuing to grow into babies. She even told me she'd be hesitant to transfer them both at once, given how likely each were to grow. What an emotional whirlwind. From 17 eggs! To 9 fertilized! To only ONE froze? To pure elation at having a 2nd embryo get to freeze quality. What a fool I was to think I'd be able to stay emotionally aloof throughout this process. The more I learn, the more I think I am actually in a more promising protocol than had I been able to do the fresh transfer. My clinic told me that there is currently a movement in the fertility world toward preferring FETs to fresh transfers, as it allows a woman's body to recover after the trauma of the retrieval itself. The prolonged observation of embryos (through days 5-7 after retrieval) also ensures that only the strongest survive. That all sounds good to me, and has put *just enough* hope in my heart to allow me to move forward toward a future FET- complete with all of its emotional & financial ramifications. I'll meet with my doctor next week to discuss timelines toward likely doing an FET with my May or June cycle. Until then? I plan to just sit back and really relax (and please don't tell me this is when we'll actually get pregnant- rule #1 in 'what not to say to someone facing fertility challenges!'). We have a lovely trip coming up (northern California!) that I plan to fully partake in with my NON PREGNANT body while our frozen babes sit securely on ice. Babycakes and I agreed this was our favorite year yet in Wimberley (I think this was our 5th?). It had a lot to do with the amazing log cabin (on a creek!) we rented, in addition to Iyla being such a fun age to have out and about with us. She definitely proved to be a bona fide country girl. Here's a look at our week long adventure in photos! This photo doesn't do the interior justice. It was absolutely cozy & stunning! Had a play date at our twin friends' ranch (Harper & Tatum) complete with horses, dogs, a kitty, and a wonderland of new toddler toys! Iyla has been in swim lessons since she was 6 months old, and admittedly I was nervous about her graduating to 'Big Girl' lessons this session. This move meant that I would no longer be getting into the water with her; she would be swimming independently with her teacher. Iyla has always loved her Water Babies swim lessons. She has also always been very clingy with me during these classes, hesitant to allow her teacher to hold her or interact with her. I definitely worried about how she would do without me in the water once the new classes began. Well, it turns out that when you remove the Mama crutch, these little buggers step up their game! It's nothing short of amazing. Iyla is in a class with 3 other little boys around the same age, and this is the first time all of them have been swimming independently of their parents. The teacher (Mr. John) noted that toddlers consistently surprise him and their parents with their ability to embrace this step toward independence. It's almost as if I can see Iyla's confidence growing as she sits with her peers at the edge of the pool. She listens to the teacher and actively participates in class. She turns around with a huge smile to call out "Hi Mama!" as I sit and observe. She was absolutely ready for this step, and just needed a gentle nudge out of the nest. And it turns out I am not the most anxious Mama in the parent crowd; every week I sit next to a Mama who legitimately screams out and constantly jerks toward jumping in the pool after her son. It's actually quite comical, and makes me feel like the most laid back Zen Mama around (which I am not). Watching Iyla become more and more independent and confident makes me wonder about what other areas of her life I might be over-sheltering her. What other crutches might I gently remove to help her build her sense of self and accomplishment even more? And so it goes… the constant learning curve of parenthood. It's a process of slowly letting go toward allowing your child to fully experience life. They need to fall down in order to learn how to get back up again; to swim freely without bumping into parental limitations. I'm so proud of my little fish… and so grateful to be on this learning adventure with her!